September 2013 – Under Every Leaf. Sorry for lack of posts recently. I have had issues with WordPress and have been building up the following on the Facebook page. I’m now hoping to post at least one post a week (I have a lot of material) from now on. If there is anything in particular you would like to see then please just message me. 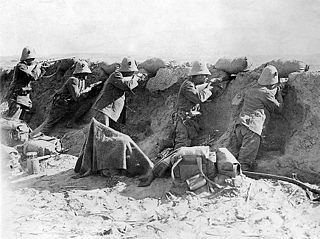 This post concerns the 1st Battalion Devonshire Regiment during the Boer War and the subsequent defense of Ladysmith between 2 November 1899 and 28 February 1900. For most of the 1890’s the 1st Battalion Devonshire Regiment was based in India. They had fought with distinction during the Tirah Campaign and by 1899 it had spent over 20 years on garrison duty around the Empire. 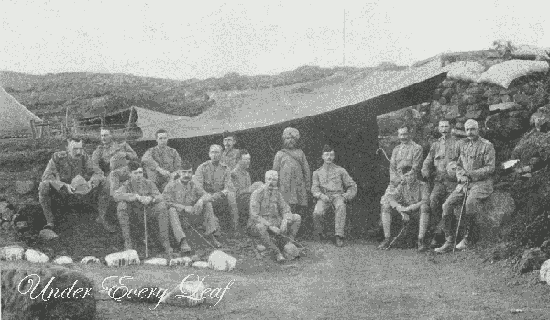 With news coming in of the deteriorating situation in South Africa the regiment was put on alert and on the 21st of September 1899 left India for the Transvaal. 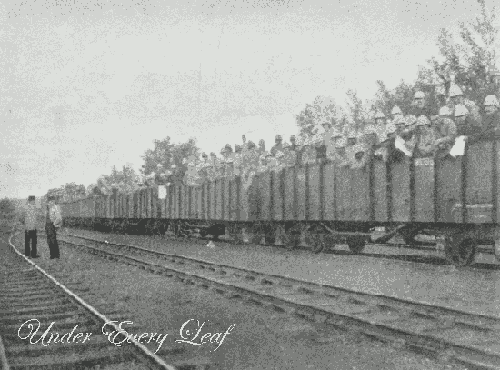 The 1st Battalion Devonshire Regiment landed at Durban on the 5th October 1899 and immediately embarked on trains for the journey to Ladysmith. 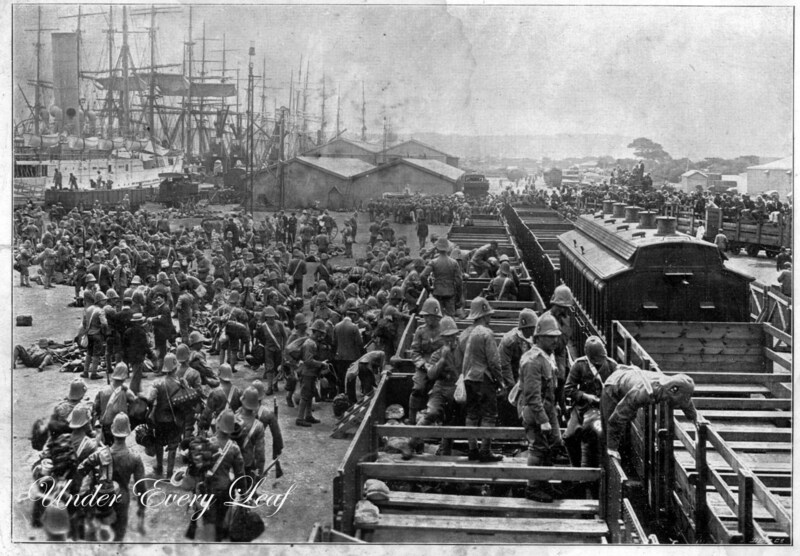 The above picture isn’t the 1st Battalion Devonshire Regiment but gives the reader a good impression of the scene that confronted them when landing at Durban. 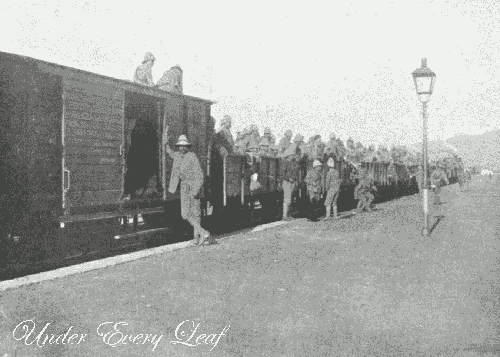 This picture shows the 1st Battalion Devonshire Regiment loaded on the open-topped wagons for there journey from Durban to Ladysmith. Lack of cover and sleep lead to an uncomfortable journey for most of the men. The battalion arrived in Ladysmith at 6pm on the 6th of October and joined The Gordon Highlanders, The Gloucester Regiment and The Liverpool Regiment as the garrison. 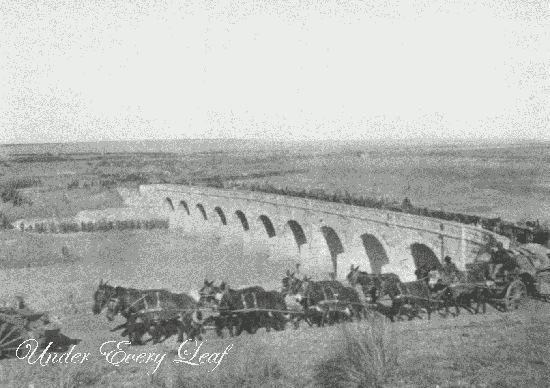 When war broke out on the 11th October 1899 with the daybreak crossing of the frontier of Natal by a Transvaal Boers force of 18,000 men with fourteen guns, the regiments in Ladysmith were tasked with improving the defenses. While Barbed wire has become synonymous with the First World War it was used extensively during the Boer War. 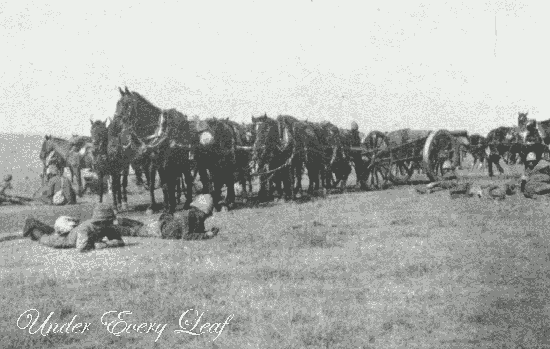 Here are the 1st Battalion Devonshire Regiment preparing the defenses around Ladysmith before the siege. This is a great shot of the trenches around Ladysmith during the siege. Again, these trenches predated the First World War by 15 years. It shows the men of the 1st Battalion Devonshire Regiment relaxing during a lull in the siege. The rubbish and detritus of war laying around the trench show this to be a ‘real’ photo during the action. 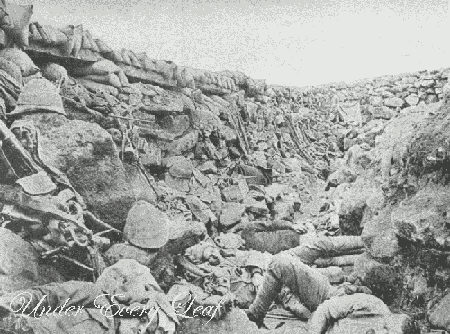 You can see the difference in this staged picture reportedly also of the trenches of Ladysmith. 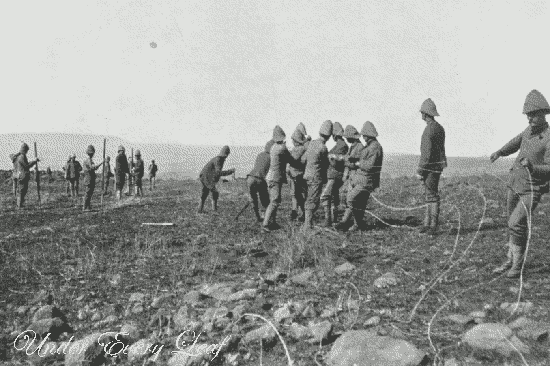 For most of October 1899 the garrison of Ladysmith lead sorties against the Boers and the 1st Battalion Devonshire Regiment gained a reputation as a hard fighting body of men. As such casualties were heavy during these engagements. 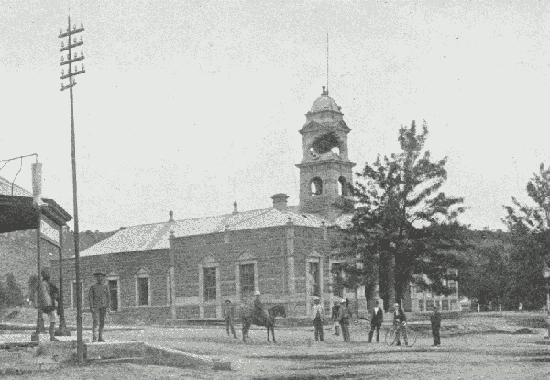 From the 2nd of November 1899 with the cutting of communications to the South, the siege began in earnest and the town came under direct Artillery fire from the Boers. 1st Battalion Devonshire Regiment had suffered heavy casualties during the siege, from enemy action and the sickness that swept the town during the last weeks of the siege. Killed and died of disease. Wounded. Devon Officers Remaining Fit for Duty at the End of the Siege, some with injuries. It also shows their Indian servant had survived. 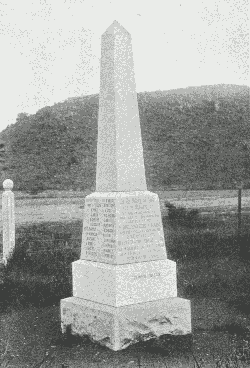 Monument to the 1st Battalion Devonshire regiment Erected in Ladysmith Cemetery. 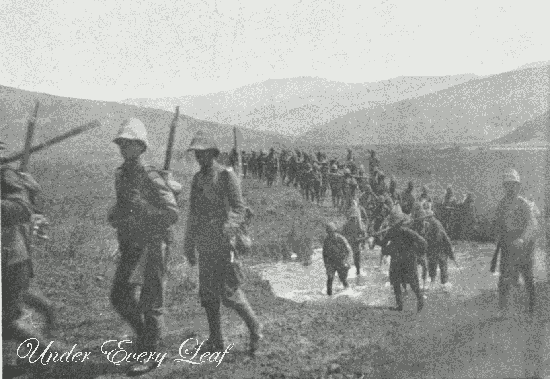 After the relief of Ladysmith, the 1st Battalion Devonshire Regiment spent the rest of the war as part of various columns who chased the Boer Armies across the Transvaal. 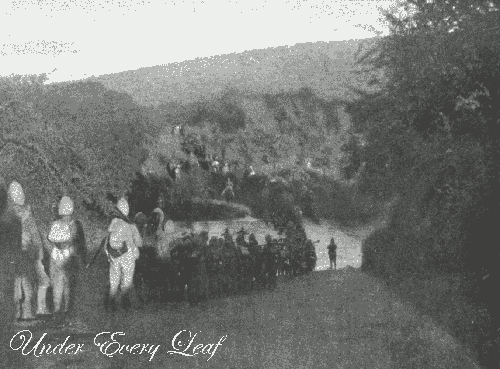 After almost a year of continuous trekking and fighting, the First Battalion were ordered to Durban. Unfortunately for the men of the regiment their destination wasn’t home to England but back to India. As the regiment left the column, the Commander of said column issued this farewell order to them. “It has been the privilege of the Major-General to include the 1st Devon Regiment in his command since the relief of Ladysmith, and it is with great regret that he has now to part with the last fighting unit of the 7th Brigade. The reputation earned by the Regiment at Elandslaagte and Ladysmith is a matter of history. Since that time this excellent corps has fought and marched in summer rain and winter frost during many long months, through the length and breadth of the Eastern Transvaal. “The face of the country will remain for many years scarred with the trenches they have dug and the works they have made. They have proved on all occasions what a sound regimental system worked by thoroughly sound officers, N.C.O.s, and men can do. The battalion left Africa on the S.S Armenia on the 3rd January 1902. They arrived back in India on the 18th were the Governor of Bombay congratulated them on their work in South Africa. The goodbye message from Lord Kitchener (not the same man as the Column Commander) is a fitting epitaph to the men who died and fought during the Campaign. It should be added to the records of the battalion, which throughout two years and three months had fought and marched incessantly in South Africa, that it had never once experienced the slightest trace of an “unfortunate incident,” and had during that time lost only three prisoners of war, two of whom lost their way in the dark at Geluk and marched into enemy’s lines, the third having been taken during the company fight in the Badfontein valley against 300 of Ben Viljoen’s men. The miles traversed by the battalion in the long continuous treks during the war are summarized as under. The miles are measured off the map simply from place to place and from camp to camp, and they do not include the distances marched in fighting, flanking, or other movements, or in convoy work and expeditions in the Lydenburg district, which, if included, would probably double the distance marched.